This one was interesting for me. Politically, at least, which is probably the only way that Ayn Rand can be interesting to most of us. I read The Fountainhead in high school, on my (overly intellectual) brother’s recommendation; I didn’t think a whole lot of it. That was it for me and Ayn Rand, other than seeing her name and ideas associated with various smug libertarians; I didn’t think a whole lot of them, either. But recently, I’ve been involved in more serious political discussions with a fellow who has opened my eyes in several ways (Though honestly, I don’t think a whole lot of him, any more), and he has recommended Ayn Rand as the philosopher, and her Objectivism as the philosophy, for the future of this country. And so I plan to re-read The Fountainhead, and add in Atlas Shrugged, and see if I want to go forward from there. And while I was cleaning out my classroom bookshelves, I came across a copy of Anthem, which, like Willa Cather’s O! Pioneers, I have seen taught to high school lit classes in the past, though I’ve never taught it or read it myself. 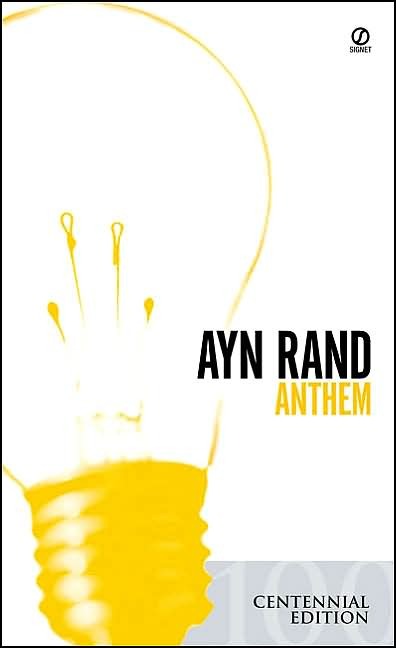 But heck, I’m going to be reading Ayn Rand quite a bit, soon; and this one’s short, so let’s give it a try. Okay, Ms. Rand. I get it. The perfect man, perfect in all ways – tall, strong, handsome, ever so Aryan, dominant and masterful, intelligent, courageous, and perfectly logical and rational – exists purely out of nature, regardless of upbringing or environment. In a dystopian future, a society degraded and debased by the horrors of COLLECTIVISM, there is no hope for the ennoblement of humanity: until a noble man is born. Once born, he cannot be restrained: he will discover his own perfection, he will stand up to the forces of evil and oppression; he will choose his mate – who will, of course, offer herself up in perfect submissive surrender to the perfect man’s perfectness, because who could resist that perfect man? – and then he will forge on into the wilderness and the chaos and conquer all that lays before him. This is his destiny. I’m being a tad too critical, however, so let me pull back. Anthem is the story of a future dystopia where everyone lives for the common will of mankind, and individuality in any form is forbidden and savagely squashed. One man is born different, and he struggles against what he is taught: that there is no truth other than what the collective holds to be true; that there is no good other than what the collective holds to be good; that the purpose of his life is to serve his brothers in all things. In his rebellion, he discovers first that there is a better way to live, one found through his own individual efforts, his own individual genius; he discovers an ancient subway tunnel, and in it he performs experiments on the forgotten relics of our own time, buried and intentionally suppressed as not for the benefit of the collective, who do not want life to be easy, as it is the purpose of man’s life to toil in service of his brethren. The individual man re-discovers electricity – because he’s a genius – and tries, in the most noble and altruistic way, to share his discovery with the collective so that life can be improved for his brethren. And he is mocked, and shunned, and driven out for his crime, for discovering things that are not known to all of the collective – and so therefore, they cannot be true. I see the point here, I do; and it is worth thinking about. Much of our society relies on shared ideals, on shared standards of truth and goodness; we still believe things because “Everybody knows it’s true.” We do think that what is good for all is good for one, and that a person who lives purely for himself is selfish, and therefore sinful and bad and wrong. We don’t believe it to the extent portrayed in this book, but that’s the point of dystopian satire: to take our flaws and magnify them in order to draw attention to them now, before they reach that terrible future point. And living purely for a collective, which destroyed Ayn Rand’s native Russia under Stalin and the communists, can surely become a great evil. I get that. I do. I see where we should keep this in mind when we attack each other for not holding to the orthodox view: the need for liberal orthodoxy leads to the movement against GMOs, which almost certainly hold no harm in and of themselves; and from there it’s a short step to the anti-vaccination movement, which has taken the distrust of Western medicine and pharmaceutical corporations to such an extreme that now it has become a hazard to the health of us all. And we liberals, with our elitist snobbery and disdain for those who are “ignorant,” as we call them – mainly those who hold other views (and not, ironically, we liberals ourselves, even in those areas where we cannot explain our positions but merely cling to them because they are the orthodox dogma, despite our own ignorance) – we are to blame for this sort of thing, to the extent it is really happening. Ray Bradbury makes a similar point in Fahrenheit 451 when he points out that the desire to remove any and all offensive material leads to the destruction of all literature and art and creative thought; another slippery slope that liberals tend to ride down in our worst moments. And all that’s fine: but this book is not. The warning is somewhat valid, but the solution offered, the belief that one single epic hero-man-god – Harrison Bergeron, if you will – can solve all problems through his own heroic efforts, is disproved by the story itself, no less than is the pure goodness of life for the collective. This dude doesn’t save the world by himself; he re-discovers what other men already knew, using their artifacts. He doesn’t run off into the wilderness by himself; he takes a mate with him, and even though he says the only happiness he has found is what he has discovered by himself, the most happy moment in the book is when he first kisses that woman he rescues – or rather, that woman who rescues herself, as she leaves the collective and tracks him down in the wilderness. And then she submits herself entirely to his will: and while he chooses a manly individual name for himself, he then gives a name to her – and it’s a name that keeps her in a subservient position, valuable only as breeding stock for the continuation of his manly genes, as he becomes Prometheus, the Fire-Bringer, and she is – Gaea. The Mother. Of the sons (not daughters) he plans to raise to be manly men just like him. And he doesn’t forge a new life with the strength of his own arms; he discovers a house built by other men, and books written by other men. And once he has built himself a mighty army of like-minded individualists, what does he plan to do? Go back into the collective society and save those of his brethren he happens to like and wish to help. So the idea that a single man acting alone is the only source of all good things? Nope. The idea that happiness can only come from individual action, without reliance on other people? Still nope. The idea that every man must live only for himself, that no man should impose his will on another, that violence can only be used in self-defense? Nope: he uses his will to suppress the will of his Gaea, and intends to commit violence against the collective in the name of his fellow men. In terms of the writing, meh. She had the clever idea to write the story in the first person, but without the singular, because the collective has eliminated the concept of “I,” allowing only “we.” Watching the narrative then twist itself into knots trying to describe single individuals while only calling those individuals by “we” or “they,” that was pretty interesting. Did a better job than the actual plot of showing how vital is the individual human ego. And I believe the individual is vital: but not because Ayn Rand convinced me of it. I realize this is only a novella, and not one of Rand’s key works; but so far, all I can see is that her philosophy is self-defeating – though certainly attractive, in that if I follow her advice and refuse to allow my individual energy and accomplishment to be taken from me for the good of others, then I get to see myself as one of these perfect epic heroes who understand the truth, that only egotism is right and good. But apart from appealing to the selfish, so far it seems like a whole lot of hooey. Didn’t like the book, would not recommend. Ayn Rand’s philosophy is crap. Rand is the Alex Jones of philosophy. In that she is popular (amongst people who don’t know anything about philosophy) but is not taken seriously enough to even be refuted because her ideas as so obviously flawed.